Beautifully crafted and designed with sleek elegance, our Green Cosmix Metal Wind Spinner is the perfect addition to your porch overhang or garden trellis. Each piece twirls independently with the slightest breeze; even in high winds, this gorgeous, whimsical design creates smooth, attention-grabbing motion that will capture your imagination. Our gorgeous three-dimensional Green Cosmix Metal Wind Spinner is the perfect addition to your outdoor space, and it makes a fabulous gift for the person who has everything. 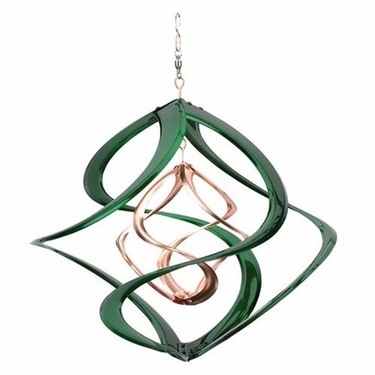 With its beautiful double-helix design that hangs a total of 15 inches (the outer spinner is 12 inches high and 10.5 inches wide), this beautiful piece of outdoor art comes with S-hook swivels for easy hanging and smooth spinning. Green Cosmix Metal Wind Spinner.